The annual Cheetah Conservation Fund Gala celebrated the speed and elegance of the cheetah this year, at a dinner on 11th of July. This was the 16th annual CCF gala, with guest speakers Jonathan and Angela Scott – the award-winning wildlife photographers and authors as guests of honour. 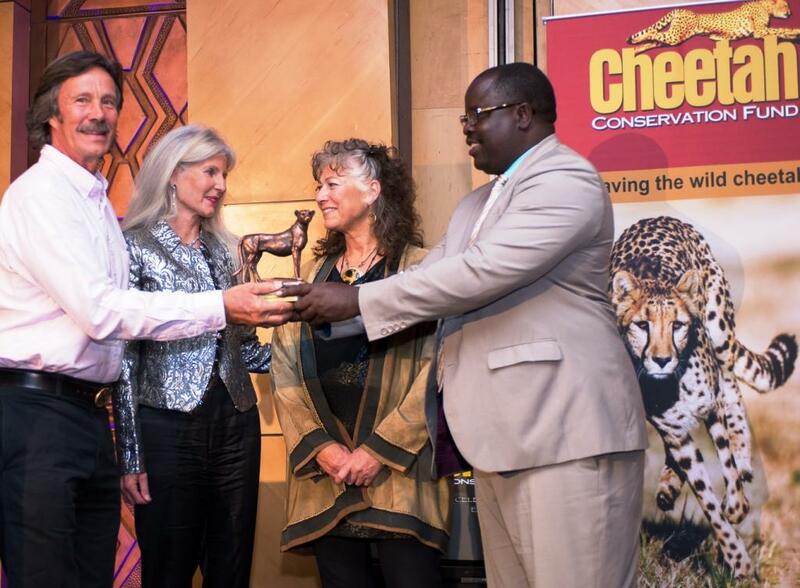 The 2014 Cheetah Conservationists of the Year award was presented to International photographers and film makers, Jonathan and Angela Scott (left), who are also called the Big Cat People. The award was presented by Dr. Laurie Marker, Founder and Executive Director of the Cheetah Conservation Fund, and the Honorable Minister Uahekua Herunga, Minister of Environment and Tourism. © Cheetah Conservation Fund. The Scotts are CCF UK patrons and well known internationally for presenting the BBC’s ‘Big Cat Diary’ from Kenya’s Masai Mara as well as other wildlife documentaries. Jonathan and Angie Scott are the only couple to have individually won the Overall Award in the prestigious Wildlife Photographer of the Year Competition – Jonathan in 1987 and Angie in 2002. The Gala’s keynote speaker, Uahekua Herunga, Minister of Environment and Tourism, represented president Hifikepunye Pohamba. While Namibia has the largest population of cheetahs, it is only one segment of the cheetah’s range, with a world population of only 10,000 individuals left in Africa. 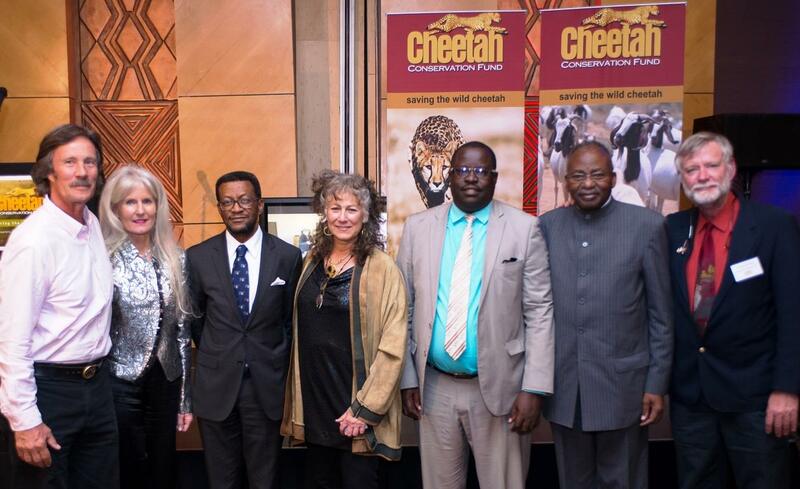 CCF’ s 2014 Cheetah Conservationists of the Year, international photographers and film makers (from left) Jonathon and Angela Scott, 2014 Cheetah Conservation Educator of the Year, Professor Tjama Tjivikua, Founding Rector, Polytechnic of Namibia, Dr. Laurie Marker, Founder/ Executive Director, Cheetah Conservation Fund, The Honorable Minister Uahekua Herunga, Minister of Environment and Tourism, Ambassador Peter Katjivivi, Dr. Bruce Brewer, General Manager, CCF. © Cheetah Conservation Fund. CCF Founder and Executive Director, Dr. Laurie Marker emphasised the need to conserve Namibia’s treasures, and talked about A Future for Cheetahs which aims to foster an economic system where humans can live and within the natural scope of a healthy, intact and bio-diverse landscape. Dr. Marker presented four 2014 Cheetah Conservation Awards, recognising those who help conserve the cheetah and the Namibian environment. 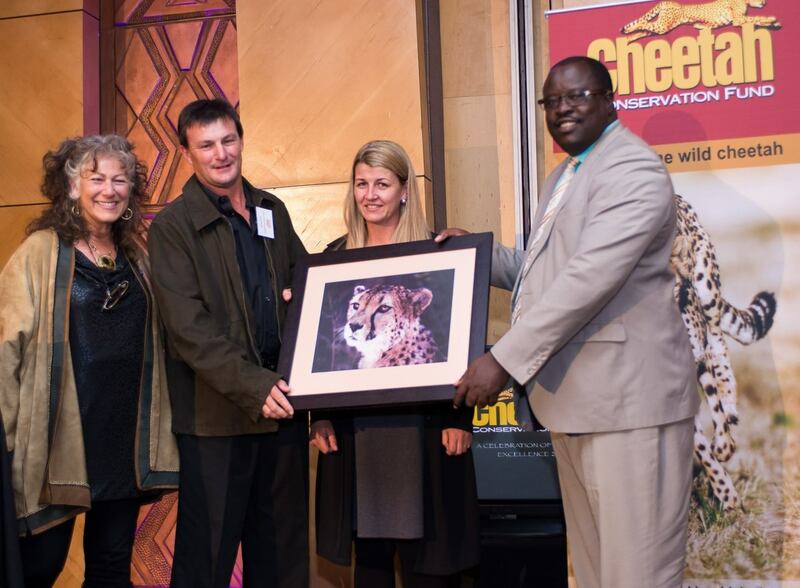 Jonathan and Angela Scott were presented with CCF’s 2014 Cheetah Conservationist of the Year for their dedication to cheetah and big cat conservation. 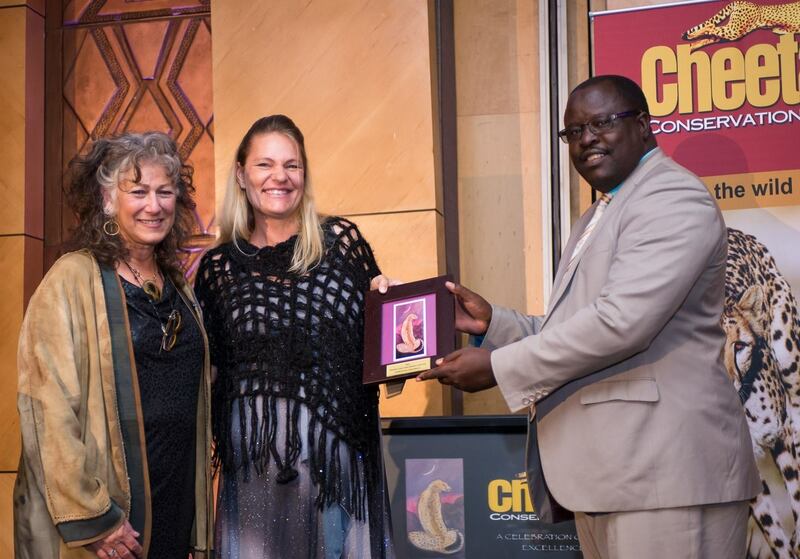 Dr. Laurie Marker presents Professor Tjama Tjivikua, Founding Rector, Polytechnic of Namibia, with the CCF 2014 Cheetah Conservation Educator of the Year Award. 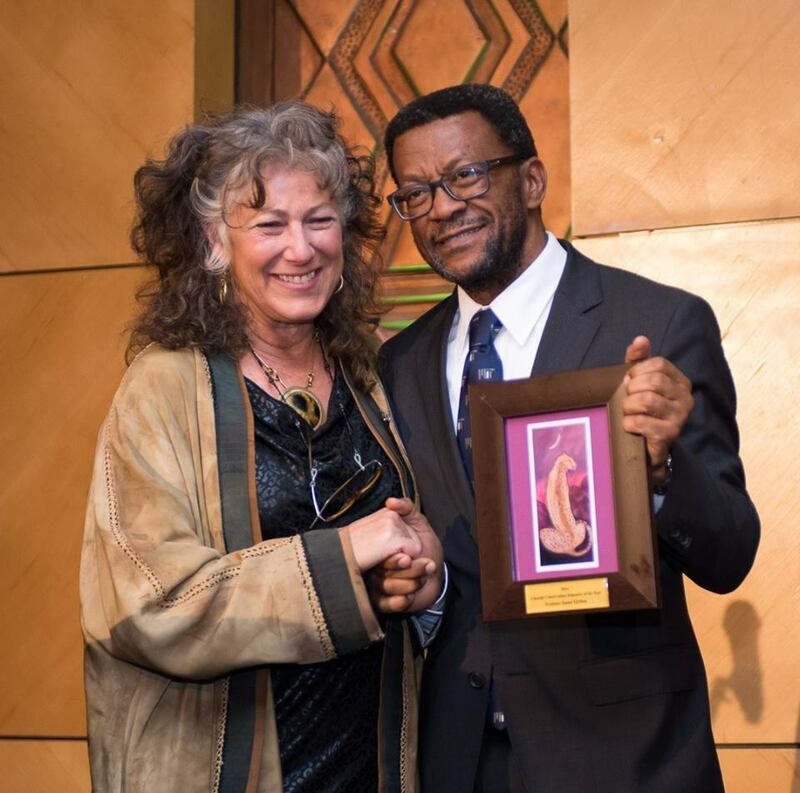 The 2014 Cheetah Conservation Educator of the Year Award was presented to Professor Tjama Tjivikua the Founding Rector of the Polytechnic of Namibia (soon to be renamed Namibia University of Science and Technology). CCF has worked closely with Professor Tjivikua and the Polytechnic of Namibia through their Natural Resources, Agriculture and Tourism Departments, training over 100 student interns in the past 15 years. CCF’s 2014 Conservation Business of the Year was presented to the Erindi Private Game Reserve, which is considered as one of Namibia’s best game viewing areas. 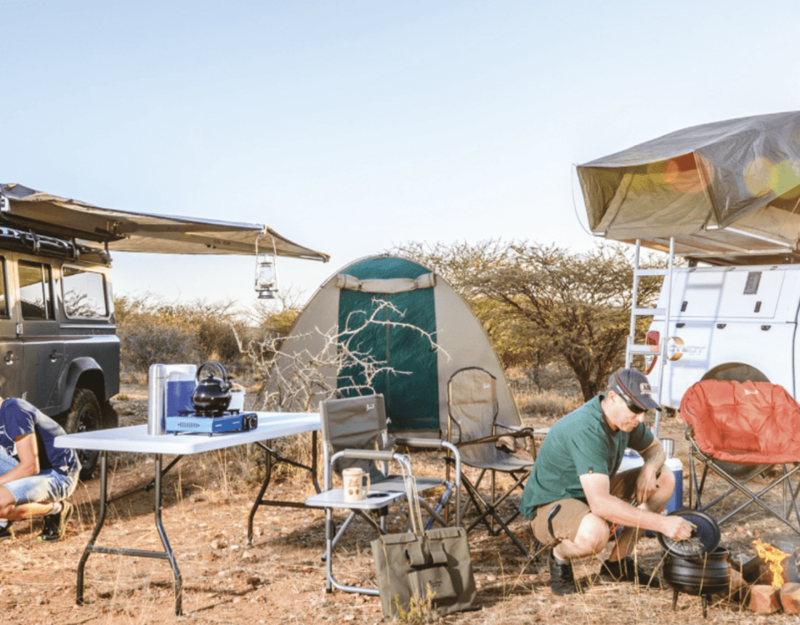 Owners Gert Joubert and his nephew, Paul Joubert have transformed Erindi into a unique, best-practice ecotourism and conservation venture—constantly, implementing and monitoring programmes across all aspects of the land rehabilitation process. Erindi has provided several of CCF’s rehabilitated cheetahs providing them with a safe home within the reserve. The Erindi Private Game Reserve, represented by Natasha Britz2014 Conservation Business of the Year. The award was presented by Dr. Laurie Marker, Founder and Executive Director of the Cheetah Conservation Fund, and the Honorable Minister Uahekua Herunga, Minister of Environment and Tourism. © Cheetah Conservation Fund. These re-wilded cheetahs have been a huge tourism asset to Erindi, providing an incredible experience for visitors to view these animals in the wild. The restoration of wildlife to Erindi has become a real-life success story. CCF’s recognized two of their staff, Johan and Tanya Britz, for their 10 years of service to CCF. Johan Britz, the CCF Conservation Farmer of the Year, is CCF’s Farm’s Manager and Tanya Britz is CCFBush/Bushblok’s Accountant. Two senior staff members of the Cheetah Conservation Fund were celebrated for their 10 years of service: Johan and Tanya Britz (middle). Johan, CCF’ Conservation Farmer, is CCF’s Farms Manager and Bush Harvest Manager and Tanya is CCF Bush/Bushblok’s bookkeeper. The Honorable Minister Uahekua Herunga, Minister of Environment and Tourism presents the award. © Cheetah Conservation Fund. The Gala event, which is now much-anticipated by Namibian conservation circles, is a celebration of the cheetah and high light the efforts CCF has made to ensure the survival of the cheetah in the wild for future generations. The evening included a candlelight dinner, and conservation awards, brought together over 350 guests from the business, conservation, agriculture and government sectors in Namibia and internationally. 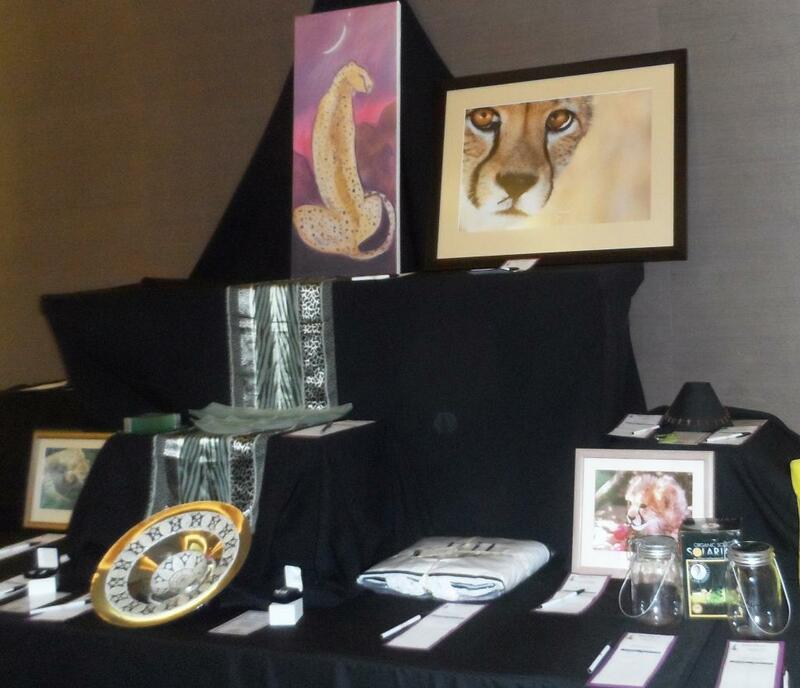 This year’s impressive silent auction included jewellery and art by well-known artists like Susan Mitchinson, whose painting was this year’s Gala logo, and photographers, Jonathon and Angie Scott, as well as getaways to elegant lodges and bed and breakfasts from throughout Namibia. © Cheetah Conservation Fund. The silent auction once again was a huge success, with over 120 items donated by local and international businesses, included artwork, jewellery, Namibian craftwork and tourism ‘get-aways’ at exclusive Namibian and international tourist venues, including stays at CCF’s exclusive Babson Guest house, the NamibRand Reserve, the Swakopmund Hotel to name a few.